Enchantress was built in Canada in 1943 for the Royal Navy, and has spent all her working life in and around Weymouth and Portland. She was designed with a strengthened hull for working with cables and chains, and was probably used in deploying barrage ballons around Portland harbour, as well as general duties ferrying troops and equipment. In 2002 My Girl was invited to register with the Historic Fleet of the United Kingdom No: 292. 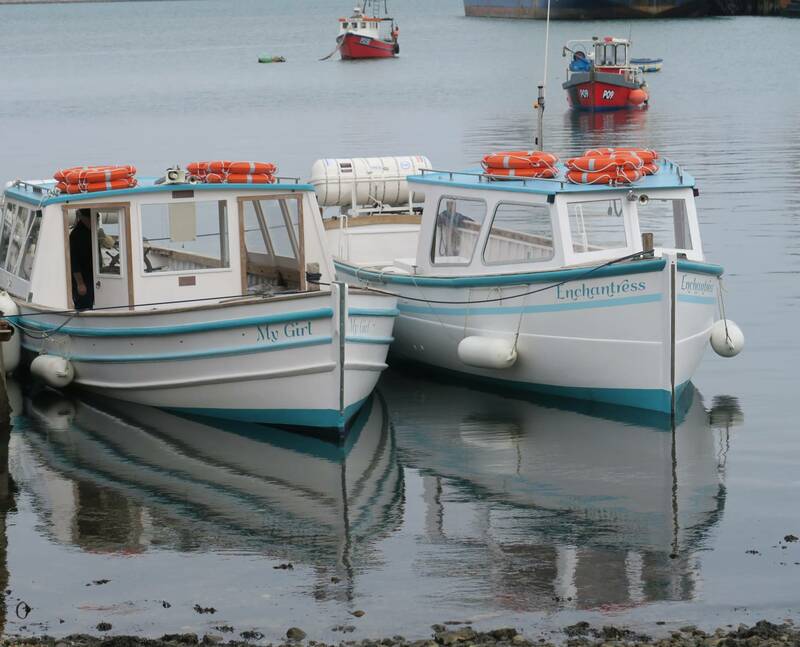 My Girl was built at the Mitchell brother’s yard in Mevagissey in 1931, as a pleasure boat licensed for 66 passengers. She has a lustrous white 36’ hull, with strong elegant lines. The Hill family who owned her were justly proud of her and looked forward to many happy cruising years. She cruised gracefully along the historic shoreline of Plymouth, and up the rivers Yealm and Tamar, stopping for cream teas at the little jetties near farm cottages. She ran to Bovisand and Cawsand with holidaymakers and campers, who sang along to guitar accompaniment. But all this was to come to an end when in August 1939 she was requisitioned by Major Glass of he Royal Army Service Corp for use in Weymouth and Portland. The Hill family devastated, but quickly volunteered to go with their much loved vessel, as they felt they could never abandon her to strangers. And so began My Girl’s, and Brothers Ron and Bert’s long association with Portland Harbour. Beginning before war was declared, they carried men and supplies to and from the forts and defences. A full complement for My Girl consisted of up to a hundred men and their equipment, ammunition and food rations. There were regular consignments of 50 shells each weighing half a hundred weight for the guns on the forts, together with five hundred gallon of paraffin in five gallon cans for search light generators. Ron and Bert were not provided with any accommodation and so had to sleep on board My Girl, who had no cabin in those days, under sheets of canvas. As the nights grew colder they slept on straw palliases on the floor of the guard room in rhw Red Barracks. Proper accommodation and pay were not forth coming, and nine weeks into the war some of the requisitioned vessels and their crews began to desert and return home. My Girl stayed and eventually Ron and Bert received some pay. During the war years, My Girl, Ron and Bert worked faithfully carrying everything they were asked to between the harbours and forts, enduring bombs, horrendous weather and personal injury. In 1941 Bert sustained an injury to his leg which worsened and eventually he was sent to Plymouth Hospital, where eventually his leg was amputated. These were bad times, but despite everything Ron kept going. He met his wife Dolores as post woman and was married in St Pauls Church Weymouth on 8 August 1942. Spring 1944, and life at Weymouth and Portland got busier. My Girl was now ferrying American pilots out to the landing craft moored in the harbours. My Girl also carried the ENSA concert parties out to forts, where they entertained the troops. AT other times she had to tow high speed radio controlle boats known as ‘Queen Bees’. By 4 June, the two harbours were packed with landing craft and assault vessels. The loading of stores and ammunition went on at a frantic pace, and with little time to rest. The hotels were full of American servicemen and were buzzing with activity and from all over Dorset men were converging on Weymouth. Bad weather ensued but throughout the night of 5-6 June My Girl remained on active duty, the weather eased and the armada left. After the war, My Girl suffered major damage at the hands of a caretaker assigned to her, but Ron worked hard to repair her. The end of war department duties were now in sight and the handover of My Girl was an emotional moment for Ron. Along with other vessels she was to be laid up, and Ron had no idea how long it would be before he saw her again, or when he would be given the opportunity to buy her back. She had served her country well, but Ron had to bid her farewall as he had to take over another vessel. Ron Hill was eventually discharged and having travelled daily to Poole to work on My Girl , he was finally rewarded by being allowed to buy Mr Girl back in the summer of 1946. At last she was back at Hope Quay with white paint replacing the old grey. Desperate to support his wife and three children Ron struggled but eventually got permission to run My Girl as a pleasure boat again. He was allowed to run from open beaches which presented enormous difficulties in easterly winds or when the tide receded! And now over sixty years later My Girl is still happily carrying passengers between Weymouth Harbour and Portland. It is a tribute to the men that built her and the Hill family that she survived the rigours of war service and remains to this day the fine craft that she is.